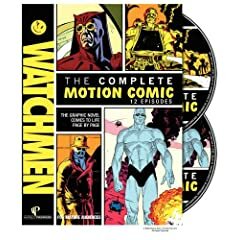 Watchmen: The Complete Motion Comic animates the Alan Moore/Dave Gibbons comic by adding limited motion, voice and sound to the panels. With the feature film adaptation out Friday, this could be the perfect way to prepare for the event. The animated superhero feature film Wonder Woman 2009 is also in stores tomorrow. The week's television release list is dominated by seven special editions of Doctor Who episodes. Other notable television DVDs out tomorrow include the tenth season of ER, the fourth season of The Hills, and the first season of the pre-Mad About You Paul Reiser comedy, My Two Dads, along with the first British season of Ramsay's Kitchen Nightmares. The week's oddest feature film is In Search of Lovecraft, where a reporter is drawn into the world of H.P. Lovecraft's fiction. I have had Aditya Assarat's Wonderful Town on my radar for over a year, and am loking forward to renting this film the New York Times called, "surpassingly lovely filmmaking." Hugh Jackman and Nicole Kidman's Australia is also on shelves tomorrow. The Return of Man from U.N.C.L.E.